FACELIFTED AUDI R8, SHARPER AND MORE POWERFUL! The new car has sharper lines and an even more powerful naturally-aspirated V10 engine. The new R8 gets a new face; the easiest way to pick out the new R8 from the old one is the three slots on top of the grille. The grille itself is lower and wider. It is flanked by two blades that rise up from the side vents. Power in the base R8 has been upped from 398 kW to 419 kW and the torque is now 550 Nm from 540 Nm. That is enough to drop the 0-100 km/h time from 3.5 to 3.4 seconds. The V10 Plus also gets power upgrades and a new name; it is now dubbed the R8 Performance... like BMW's M Performance? Anyway, it now delivers 456 kW (7 more) and it will do the 0-100 km/h sprint in 3.1 seconds. 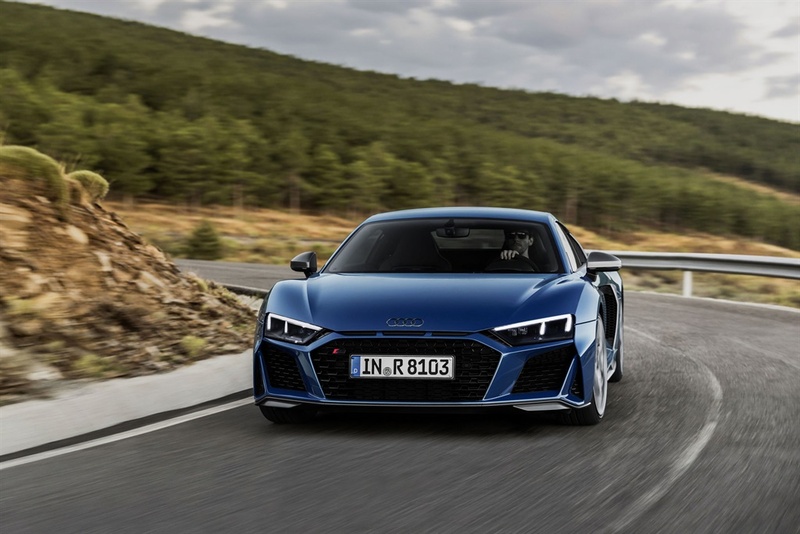 Audi says that the new R8 will deliver sharper handling thanks to the work they did to the standard electronic steering and the optional dynamic steering. They also worked on the drive modes; you'll be able to pick out more difference between them now.